Neil Lightfoot’s How We Got the Bible , revised and expanded 3rd edition, is available today only for $1.99 in Kindle format. This book is a wonderful beginning resource to help one understand how the Bible came to be in English. Today only. Learn about manuscripts, transmission of the text, the Canon, and other important topics. Isaiah 19 is a continuation of the announcement of the LORD’S judgment upon Egypt. 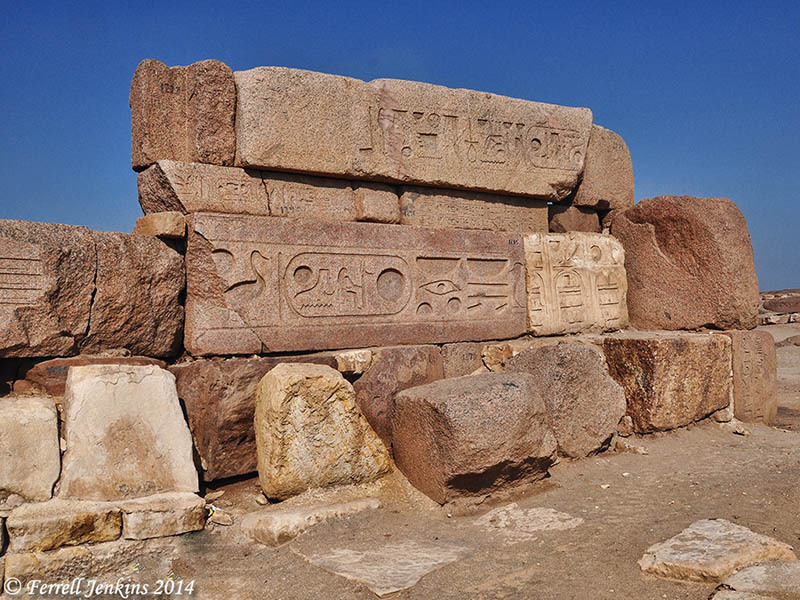 All over Egypt we see evidence of the ancient fallen power. This fallen statue of Ramses II at Memphis illustrates what happened. 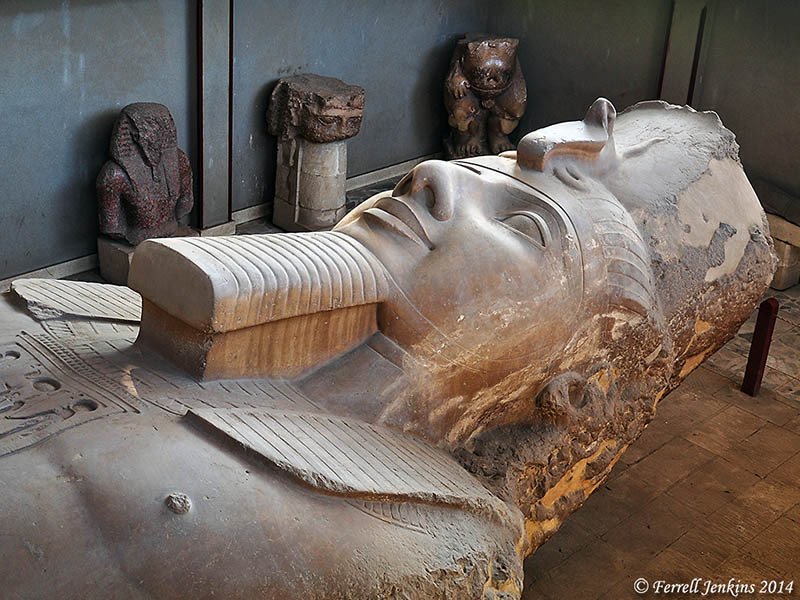 Fallen colossal statue of Ramses II at Memphis. Photo by Ferrell Jenkins. The princes (leaders) of Zoan, and other places in Egypt, are likened to pillars that were to be crushed. Columns, pillars, and statues are scattered over the ruins of ancient Zoan (Tanis) in the land of Goshen. In the photo below we see columns stacked up. Fallen stonework piled together at Zoan (Tanis) in Goshen. Photo by Ferrell Jenkins. Israel and Judah found themselves positioned between the great political and military powers of the time: Assyria and Babylon to the north (or east) and Egypt to the south. In Isaiah 18 and 19, the prophet deals with the power to the south. Cush is likely more or less synonymous with Egypt for this purpose. The region is described as one of unrest. The IVP Bible Background Commentary comments on Cush, and explains the difference between Cush and modern Ethiopia. Cush can refer to several different places in the Old Testament, though it most frequently is the designation for the area translations usually render “Ethiopia.” This is misleading, for the area Cush refers to is not modern Ethiopia (Abyssinia), but the area along the Nile just south of Egypt, ancient Nubia (in modern Sudan). The boundary between Egypt and Nubia in ancient times was usually either at the first or second cataract of the Nile. It is unlikely that Nubia ever extended much beyond the sixth cataract at Khartoum. Nubians now live in Sudan and southern Egypt near Aswan. Some of these people were displaced as a result of the building of the New High dam at Aswan and the formation of Lake Nasser. Some of the Nubians still live in Sudan. They are energetic people and good at selling their wares to the visiting tourists. At the first cataract of the Nile some Nubians have set up a small village with shops and camel rides for those brave enough to try. Notice the example below called Kush (Cush) House. 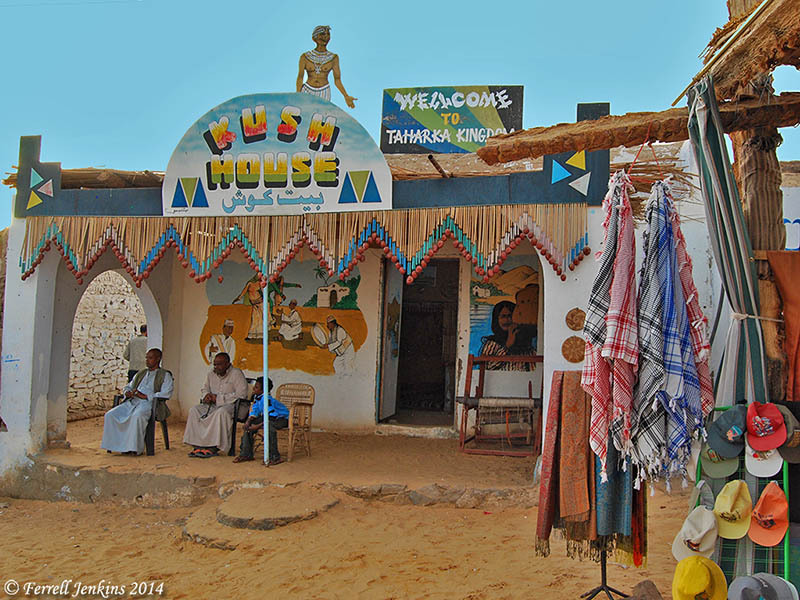 Nubian village at Aswan, Egypt, highlights connection with Cush. Photo: F. Jenkins. One sign reads “Welcome to Taharka Kingdom.” Taharka ((English Bible: Tirhakah). A photo showing Tirhakah under the protection of the god Amun is available here. In the oracle concerning Damascus (Syria), Isaiah uses illustrations of the gleaning of grain and olives –plants common in that time. 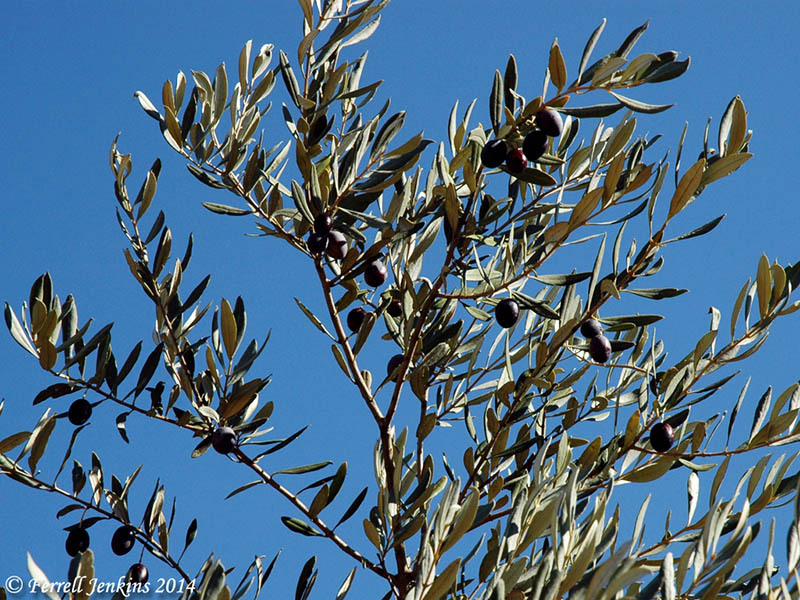 We could probably shake off several more of the olives from the limbs below and have a better illustration of what Isaiah says, but hopefully this will serve to illustrate the point. Olives on a branch at Neot Kedumim. Photo by Ferrell Jenkins. Another thing Isaiah says is that Damascus would no longer look to the altars they had made with their own hands. These images, and the gods they represented, would fail. Altars of incense came in all sizes in those days, and many have been uncovered by archaeologists working at various sites. The altar below, now displayed in the Israel Museum, is from Megiddo. 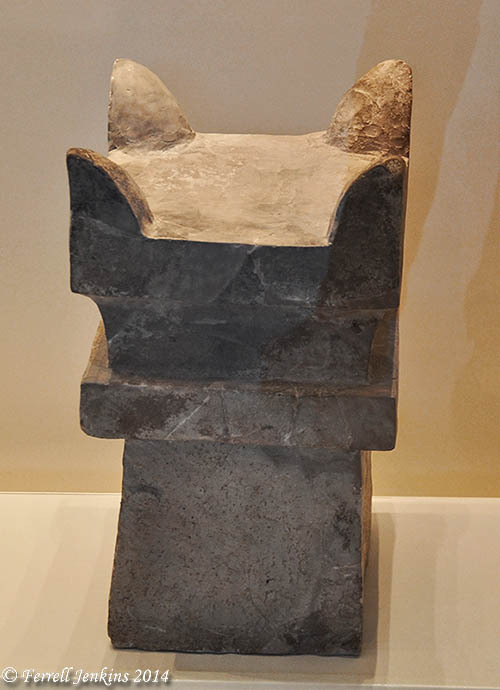 Horned altar of Incense from Megiddo. Israel Museum. Photo by Ferrell Jenkins. When the prophets of ancient Israel pointed out the coming judgment of God upon the Israelites they typically pointed out that their enemies had already, or were going to, face the same judgment. This applied not only to the major powers such as Assyrian, Babylon, or Egypt, but also smaller powers that lived closer. It included Syria (Damascus), the Philistines, Moab, Edom, and the Ammonites. When Judah is being addressed there will be also a reference to Israel (Ephraim, Samaria). Chapter 15 begins “an oracle concerning Moab.” We have, in previous posts, mentioned many of the Moabite towns. 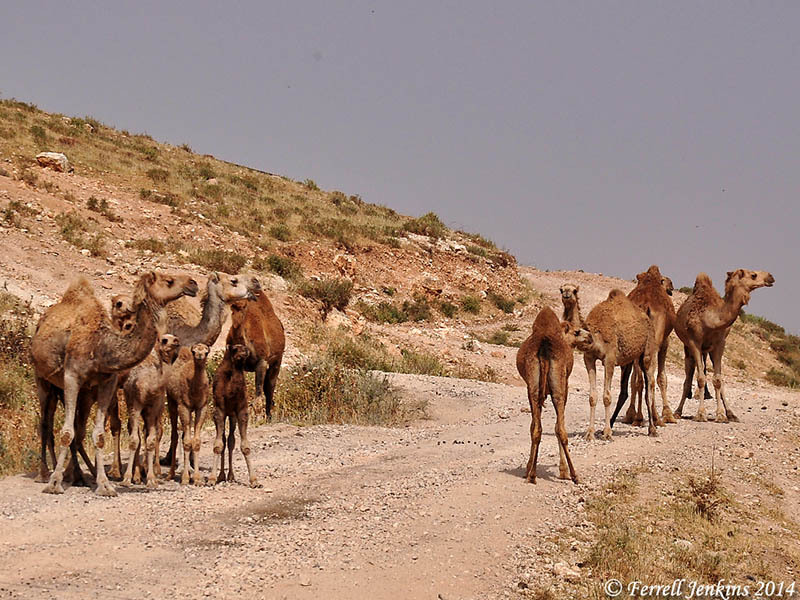 I think you can use the search box and locate photos of Dibon, Nebo, Medeba (Madaba), Elealeh, and Kir-hareseth. Isaiah mentions the daughters of Moab fleeing across the Arnon. We commonly think of the Arnon River (or gorge) serving as the dividing line between Moab (to the south) and Ammon (to the north). However, you will notice that most of the towns mentioned above are north of the Arnon. The boundary changed throughout Biblical history. At the time of Isaiah the boundary certainly includes cities north of the Arnon. 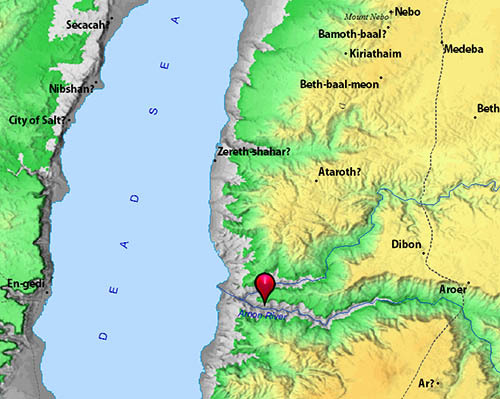 The Arnon River is shown on this map. BibleAtlas.org. 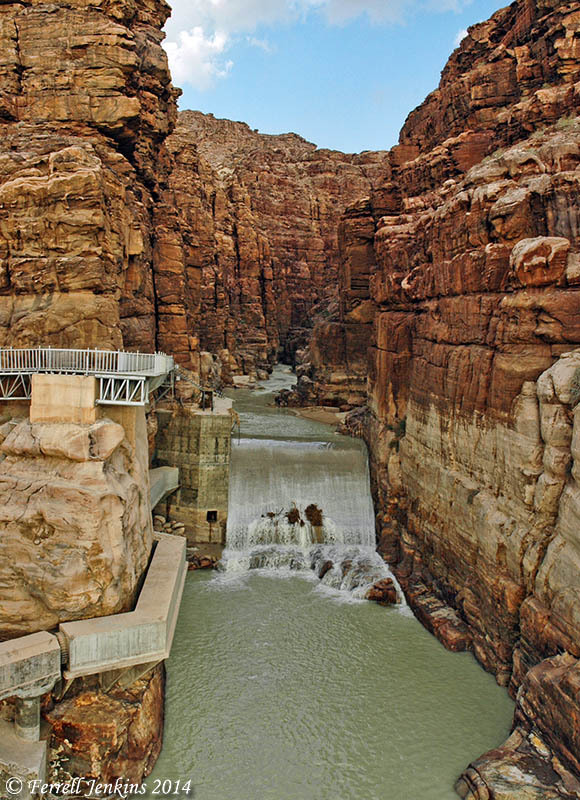 The Arnon gorge in Transjordan. View south. Photo by Ferrell Jenkins. From this point the river flows west about 13 miles till it reaches the Dead Sea. 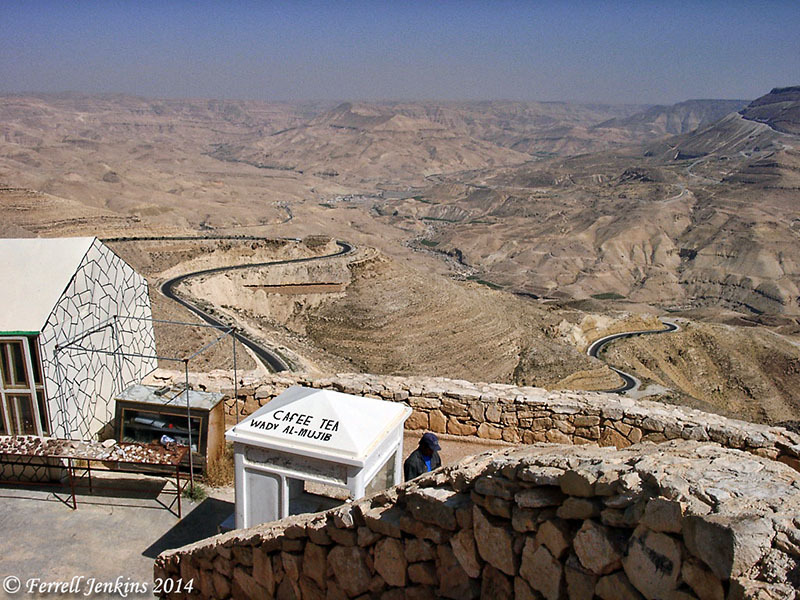 A modern road now runs along the Dead Sea, and a small dam has been constructed to help control the water when it fills the gorge. The Arnon River immediately before flowing into the Dead Sea. View east. Photo by Ferrell Jenkins. Isaiah 14 continues to deal with the downfall of Babylon. In great poetic language we learn that the cedars of Lebanon will rejoice that there is no longer a woodcutter to come up against them. The Assyrians came before the Babylonians to take advantage of the wonderful cedars of Lebanon. 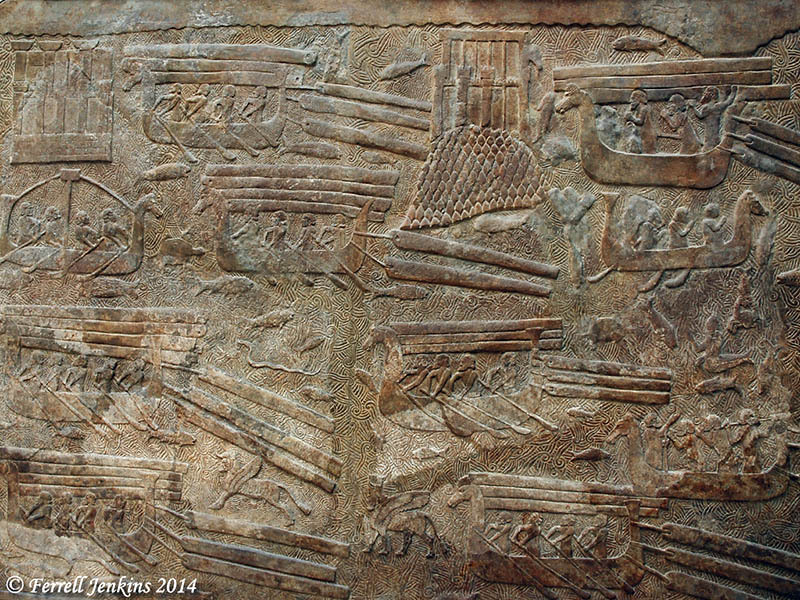 Sargon II left a frieze on the wall of his palace at Khorsabad showing timber being transported for use in the construction of Assyrian palaces. Assyrians transporting Cedars from Lebanon. Louvre. Photo by Ferrell Jenkins. The above frieze was produced at Khorsabad during the Neo-Assyrian period, about 713-706 B.C. The Louvre website has this explanation about procuring timber. from this region as the cuneiform inscriptions explain. The trees felled in the Lebanese mountains were carted from Sidon to a port south of Tyre. The timber was loaded on ships that sailed north along the Phoenician coast, skirting Tyre then Ruad; it was no doubt unloaded at the mouth of the Orontes River. From there the timber could be transported to Assyria by river or road. More information about the frieze is available at the Louvre website here. 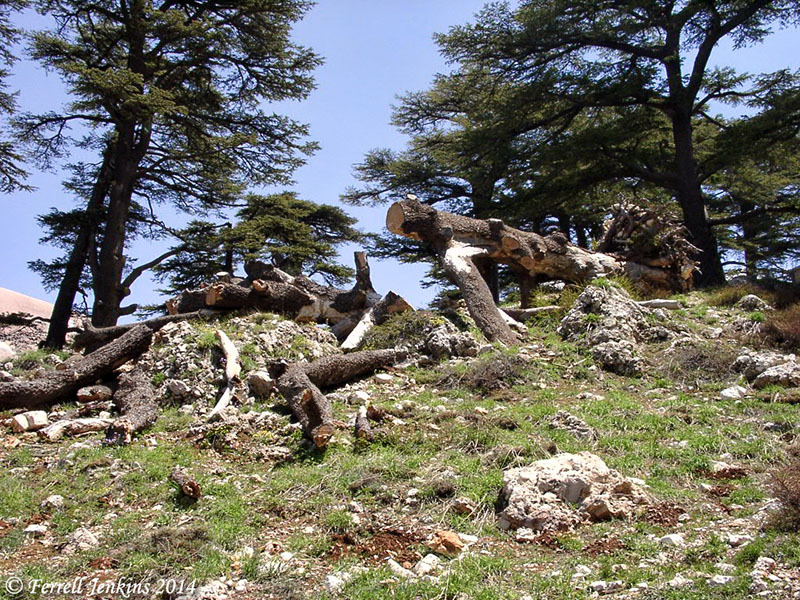 The Cedars of Lebanon grow at an altitude of more than 5000 feet above sea level in the northern Lebanon mountains. Only about 300 of the great trees remain near Besharre. In the photo below I show a cedar that has fallen during a storm and is now being cut for use in souvenirs. The trees are protected against indiscriminate cutting. 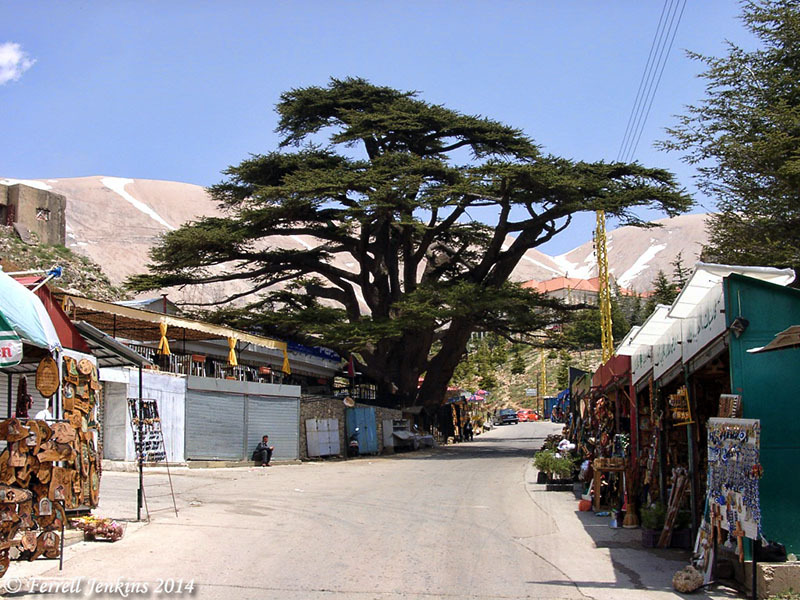 Cedars of Lebanon are now protected from cutting. Photo by Ferrell Jenkins. The little village at the Cedars is built around one of the larger remaining trees. You can see the cedar wood plaques displayed at the shops along the main road. A large Cedar of Lebanon in a little village at the location of the largest remaining grove of trees. Only small bands of snow could still be seen on the mountains in early May. Photo by Ferrell Jenkins.